Overview and Purpose: Students will learn that abstraction starts with objects from reality and changes them according to the artist's discretion. 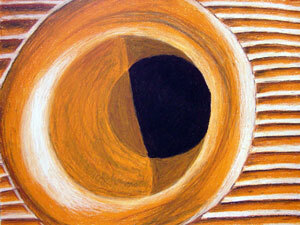 Students will produce a drawing that translates as an abstract drawing, but is completed in a representational manner. Objectives: The student will learn the Precisionist form of abstraction and produce an abstract drawing with oil pastels. Delivery of info: Students will be presented with examples of Precisionist abstract paintings, including those by Georgia O'Keeffe. Students will discuss the philosophies of the Precisionist artists and how they relate to the creation of abstract art. Teacher will lead in a demonstration of how a Precisionist drawing may be composed from an everyday object.